February 24, 2018  We know the names of the stars: Mikaela Shiffrin, Shaun White, Adam Rippon. But what about the athletes who compete and receive virtually no attention? February 24, 2018  We have an update on the biggest stories in the 2018 Winter Olympics in the past week. February 23, 2018  Russian athletes went one-two in the women's single figure skating competition. Alina Zagitova took gold and Evgenia Medvedeva the silver. Bradie Tennell was the top U.S. finisher in ninth. February 22, 2018  Mikaela Shiffrin won her second medal of the Pyeongchang Olympics with silver in the women's Alpine combined. Lindsey Vonn had the best overall time after the downhill but couldn't finish the slalom. February 21, 2018  It was an up and down day at the Olympics. All three of the U.S. women's figure skaters fell or stumbled in the short program, but the U.S. women won their first ever medal in cross-country skiing. February 19, 2018  More than 160 Russian athletes who passed drug tests were allowed to compete in the Winter Olympic Games, even though the Russian Olympic Committee was banned for using prohibited substances. February 15, 2018  Mikaela Shiffrin won an Olympic gold medal in the giant slalom on Thursday. It's her second career Olympic title. At the 2014 Sochi Games, Shiffrin won the slalom — a title she will defend Friday. February 14, 2018  For the first time since 1994, no current NHL players will play in the Olympic hockey tournament. These means many of the best players won't be in Pyeongchang, but will this make the games less exciting? February 14, 2018  American snowboarder Shaun White had a dazzling final run to reclaim gold in the men's halfpipe — his third gold. February 12, 2018  At the Winter Olympics, it was a weekend of high drama. 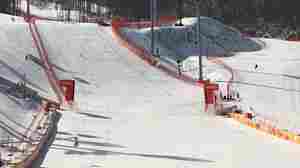 High winds scuttled the finals of the men's downhill and women's giant slalom. And the U.S. won its first medal in men's luge singles. February 10, 2018  The downhill is one of the most anticipated events of any Winter Games. The race is raw power and speed as competitors plummet down a mountain course, sometimes going over 90 miles per hour. February 10, 2018  We have the latest on the Olympic Games in South Korea. February 9, 2018  Winter Olympic sports combine grace, beauty and danger, where athletes defy and even embrace risk. In downhill skiing, a racer has to find confidence amid the terror of a headlong plunge down a mountain. February 7, 2018  The specter of doping continues to hang over the Pyeongchang Olympics as the competition starts this week. Olympic officials squabbled openly about the damage being done to the games.